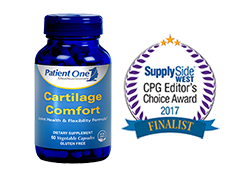 Farmingdale (August 2017) — Cartilage Comfort by Patient One MediNutritionals has been selected as a Finalist for the 2017 SupplySide CPG Editor’s Choice Awards. Five consumer packaged goods (CPG) products were selected for achievements in innovation and market impact in 27 different categories. Cartilage Comfort was named to the short list in the Joint Support category. One winner in each category will be announced at SupplySide West 2017 during presentations at SupplySide Central on September 27 and 28 at Mandalay Bay Resort in Las Vegas, Nevada. UC–II has been shown in clinical studies to be more than twice as effective in promoting joint health as 1,500 mg glucosamine and 1,200 mg chondroitin as rated by WOMAC, VAS and Lequesne functional indices. While MSM is most known for its ability to support collagen production, the primary constituent of cartilage, skin and connective tissue, research indicates that MSM also modulates histamine release and inflammation. Meriva bioavailable turmeric supports normal inflammatory response and joint comfort. 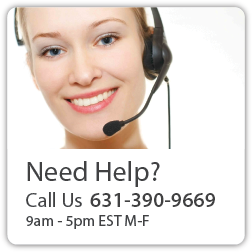 For more information, visit www.patientoneformulas.com. For 21 years, SupplySide has helped dietary supplement, food, beverage, personal care and cosmetic professionals find information to explore, discover, innovate and market their next best-selling product. "In the past few years we’ve had tremendous success highlighting products coming to market, driven by the innovative ingredients highlighted at SupplySide," said Heather Granato, vice president, content, in Informa’s Global Health & Nutrition Network. "Our team was impressed this year at the range of products and out-of-the-box thinking that these companies are putting into product development to reach their target markets." About Patient One MediNutritionals: Available exclusively through healthcare professionals, Patient One provides a diverse range of medi-nutritional formulas featuring today’s most advanced ingredients, supported by clinical data. Patient One supplements span categories including Cardiovascular Health, Immune Support, Digestive Health, Bone, Joint & Muscle Support, Cognitive Support, Endocrine Support, Healthy Aging, Detox & Weight Management, Emotional Wellness, Men’s & Women’s Health, Eye Care, & more. About SupplySide West: Hosted by Informa Exhibitions, SupplySide West brings together more than 15,000 ingredient buyers and suppliers from the dietary supplement, beverage, functional food, personal care and sports nutrition industries. SupplySide West is all about the science and strategy around the development of finished products that drive the global business economy. For more information visit www.supplysideshow.com.